PHILADELPHIA -- The New York Giants blew a 16-point first-half lead and were unable to exploit a decimated Eagles secondary in the second half of a 25-22 loss at Lincoln Financial Field. It left star wide receiver Odell Beckham Jr. without answers for why the Giants managed just 61 yards on 12 pass attempts in the second half. 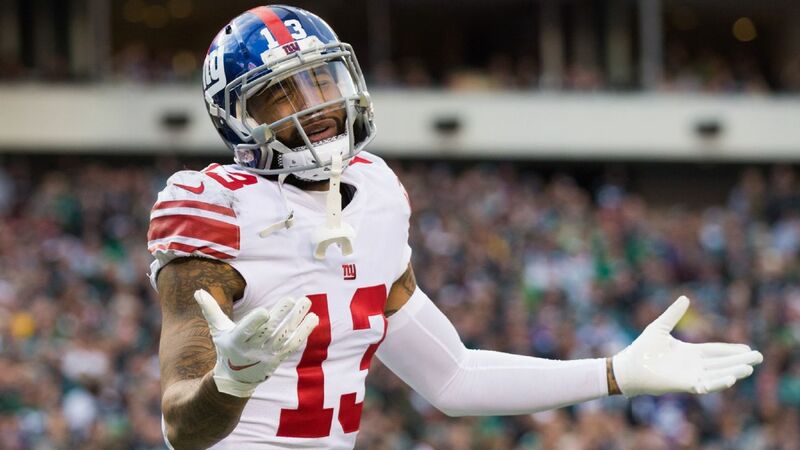 "Honestly, that is a question for Coach [Giants coach Pat Shurmur]," Beckham said after finishing with five catches on nine targets for 85 yards. "That is not really my kind of question. I don't call the plays. I just do what I'm told to do and go out there and execute. Whenever I get an opportunity to do something, I try to make the most of it. If I don't have that many opportunities all I can do is do what I can when I do have an opportunity. That is more a question for Coach. "Coming in, knowing that they've struggled in the secondary, personally, I would've loved to attack them. But it wasn't in our game plan." The Eagles' secondary was depleted by injuries. Four of the Eagles' top five corners did not dress. The only one who did, Rasul Douglas, did not practice all week and was used sparingly. The three primary corners for Sunday's game -- Cre'von LeBlanc, De'Vante Bausby and undrafted rookie Chandon Sullivan -- weren't on the Eagles' active roster as of a month ago. Only LeBlanc had started an NFL game before Sunday. LeBlanc spent much of the second half trying to cover Beckham and Sterling Shepard. That seemed like a matchup the Giants could exploit. The Giants (3-8) had success in the first half while building a 19-3 lead. Manning completed 19 of 25 passes for 236 yards with a touchdown. Beckham had three receptions on five targets for 63 yards. "Think that is a question for Coach. Honestly, I don't know. I don't call the plays," Beckham said. "I just go out there and execute." It didn't help that Beckham needed another IV after cramping up during warm-ups before the second half. He missed the opening drive, a three-and-out. The Giants then wanted to spell rookie running back Saquon Barkley on the second drive. Shurmur pointed to other reasons why the offense suddenly stalled. He insisted he wasn't frustrated that they failed to exploit the Eagles' secondary more. "I'm not frustrated. We could have," Shurmur said. "I just mentioned it. It was the story of the second half, especially early. We weren't making the yards that we need on the plays that we called. And we had penalties that knocked us off. So then you get away from the stuff that you certainly would like to do. And that's the deal." The Giants ran just 21 plays in the second half. They held the ball for little more than 10 minutes. The Eagles held the Giants to 56 total yards in the second half. Barkley ran for 94 yards and had a rushing and receiving touchdown in the first half for the second consecutive game. He had 101 yards on the ground after the opening drive of the second half. But Barkley finished with 101 yards rushing. He managed five touches in the second half. Beckham and Barkley managed just seven touches between them in the second half. Why? "I couldn't tell you the answer to that," Beckham said. "At this point of my career, I've been through a lot, so nothing really surprises me. Just don't really know the answer to that." Odell Beckham Jr. says he can't control the officiating and also discusses not taking advantage of the Eagles' banged-up secondary.